What model of kill switch is compatible with my radio? Click here to see the Radio & Kill Switch Compatibility Chart. Visit the support page to contact us if your radio is not on the chart. Will the Killer Bee remote LED or Buzzer work with the Super Bee? No. They have different plugs and voltages. The Killer Bee powers a single 3v LED. The Super Bee can power multiple 6v LED lights. I have a Super Bee or v1 Killer Bee. How do I set the 3rd channel on my radio? Set your 3rd channel to operate in 2 position mode. Check this thread on our forum for more info. I have a 3 channel radio. What kill switch do I need? First check to see if your radio is on our compatibility chart. Then buy a Super Bee kill switch kit. The Super Bee works with most all 2, 3, and 4 channel radios. I have a 3 channel radio. Can I run a kill switch and a light controller? Yes. Get a Killer Kontroller light controller and just follow the instructions that come with it. Then get a Super Bee kill switch kit and turn off the Aux mode by flipping down the #1 dip switch. Then plug the Super Bee into the Aux output on the Killer Kontroller. The Aux button on your transmitter will now turn your LED lights on and off. To kill the engine just turn off the transmitter power switch, and the Super Bee will kill the engine. I have a 2 channel radio and I want a kill switch. Get a Super Bee kill switch and a 2-way splitter cable. Plug the splitter and Super Bee into your Steering channel. Install ignition cable. Flip down the #1 dip switch on the Super Bee. When you turn off the transmitter power it will kill the engine. I have a stock HPI radio. Can I use a Super Bee? If you have the HPI 3 channel FM radio then Yes you can use a Super Bee. There is no brand or model of kill switch that is compatible with the newer 2.4ghz 2 channel HPI radio. I have a Spektrum brand radio. What kill switch do I need? Get a Super Bee. It works with Spektrum 2 or 3 channel radios. The Super Bee works with most any brand of radio, but you can know for sure by looking at our compatibility chart. 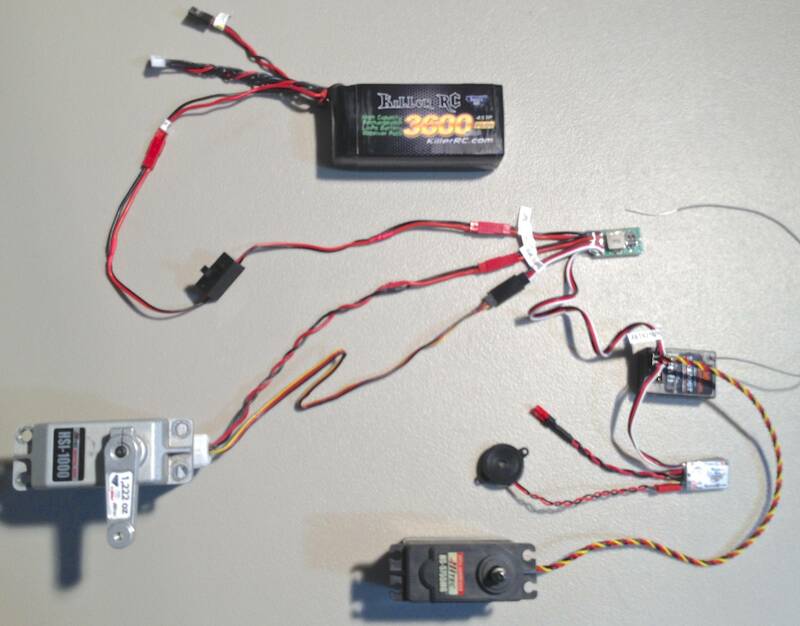 Will a kill switch work with the new HPI 2 channel 2.4ghz radio that comes with the Baja? No. There is not any model or any brand of kill switch that will work with the HPI 2.4ghz 2 channel radio. It's one of the few radios that is not compatible with a kill switch. We strongly suggest that you get a 3 or 4 channel radio. We prefer Futaba FASST radios. I have a Futaba 4PK. What kill switch should I get? Use a Super Bee kill switch on your 4th channel. Then you can assign a radio button to your 4th channel and kill the engine with that button. Then you can use the 3rd channel for a light controller or extra brake servo if you want. I have a failsafe. Why do I need a kill switch? A failsafe is certainly a good thing to have, and I recommend that you use a failsafe in addition to a kill switch. The more protection, the better. But a failsafe alone is just not good enough. With a failsafe you still have many loopholes that can cause a runaway. The receiver can fail, the battery can die, the servo can go bad, the throttle linkage can bind or become loose, the carburetor can freeze. In those instances a failsafe will not stop your 30 pound large scale R/C vehicle from running away and causing major damage. When you add a Super Bee kill switch you have a “watchdog” that will not let your engine run unless it senses that there is a good radio signal at all times. You can also manually kill your engine at any time if you see that something is wrong with your R/C. It is also very convenient to have a kill switch for engine tuning, checking spark plug color at high RPMs. And it’s just nice to be able to pull your R/C into the pit and kill the engine via the transmitter, and not have to reach down and press the kill button. Note: On Spektrum brand radios it is very important that you reset the built-in failsafe after you install a kill switch. Because of how the Spektrum radios work the kill switch needs the failsafe to be set in order to kill the engine if you loose radio signal. For most newer Spektrum radios just rebind the receiver and transmitter, and hold the aux channel button in the off position during the failsafe resetting mode. On the kill switch ignition wiring, which wire is positive and negative? It doesn't matter. There is no polarity. Why does my gas RC car run away sometimes? Gas RC cars have an ignition system, unlike nitro RCs, this ignition system produces a high voltage spark for the spark plug. These high voltage pulses create radio waves that can interfere with the function of your RC cars’ radio system, causing your radio receiver to temporarily stop working properly. Sometimes it helps to replace the spark plug with a new one. The spark plugs have a resistor inside that can go bad. Using a quality 2.4ghz radio system can help reduce radio glitches, but glitches can still happen. The best way to prevent runaways is to install a Super Bee kill switch, which will shut your engine down automatically whenever one of these radio glitches occurs, keeping your RC from running off and damaging itself and other property. Can I connect LED headlights to my Super Bee kill switch? Yes. The Super Bee has a 6v LED output that will power up to 50 LEDs, like the LEDs we sell in the Killer RC store. The LEDs will light up and let you know what mode the Super Bee is in. If you have an older Killer Bee then you can only plug in one of our 3v LEDs which is made specifically for the Killer Bee only. Can I put a kill switch on my nitro R/Cs too? Yes, the new Bumble Bee Nitro Killswitch. It works on pretty much any RC vehicle that runs on any kind of liquid fuel. With the Super Bee kill switch can I remotely shut down my engine via the transmitter? Yes. You just need a radio with an unused 3rd channel. Just flip the trim button on your 3rd channel to remotely kill the engine at any time. If you only have a 2 channel radio then it will kill the engine if you turn off transmitter power or have a radio glitch. Does the Super Bee kill switch shut down my engine if my battery power gets low, or totally shuts off? Yes. If you lose battery power, or if your battery voltage drops too low the Super Bee kill switch will shut down your engine to prevent your RC vehicle from running away. What does the green light on the kill switch do? The light on the Super Bee kill switch tells you what mode the kill switch is in. Refer to the instructions for what each color and blink pattern means. I have a twin cylinder engine. What kind of kill switch do I need? We make a special version of our Super Bee kill switch and it is found in our store just for twin engine setups. Will the Super Bee Kill Switch cause any radio interference? No. The kill switch can be mounted right next to the radio receiver without affecting it. Also, the engines' high voltage ignition system is totally isolated from the kill switches' circuit that connects to the receiver. How big of a hole do you drill for the optional Super Bee remote LED to mount in? Drill a 17/64" hole, or use a 1/4" bit if you don't have a 17/64" bit, then just ream the hole a little bigger. Stick the LED through the hole, put the clear lens on the LED, then snap it in the hole. Then put some "Goop" or "Shoe Goo" adhesive on the underside around the LED to help hold it secure. Let the Goop dry for an hour or two. See detailed instructions on our downloads page. Can you put a disconnect inline with the wiring so that I can quickly remove the engine without having to remove all the wiring? Yes. I can add a Deans Micro disconnect anywhere inline. I can put it wherever you want. The cost for this is usually an extra $7 per disconnect. Will your kill switch kit work on my FG, RedCat, or other non-HPI brand gas RC? Yes. The ignition systems works pretty much the same on most all Zenoah and Chung Yang engines. The only difference is how long you need your wiring to be. My kits come with 20” long wiring. If you need the length longer or shorter then just let me know. I can make it whatever length you want. Can I use a Super Bee kill switch on my RC boat? Yes. The Super Bee kill switch will work on a 2 cycle gas boat. 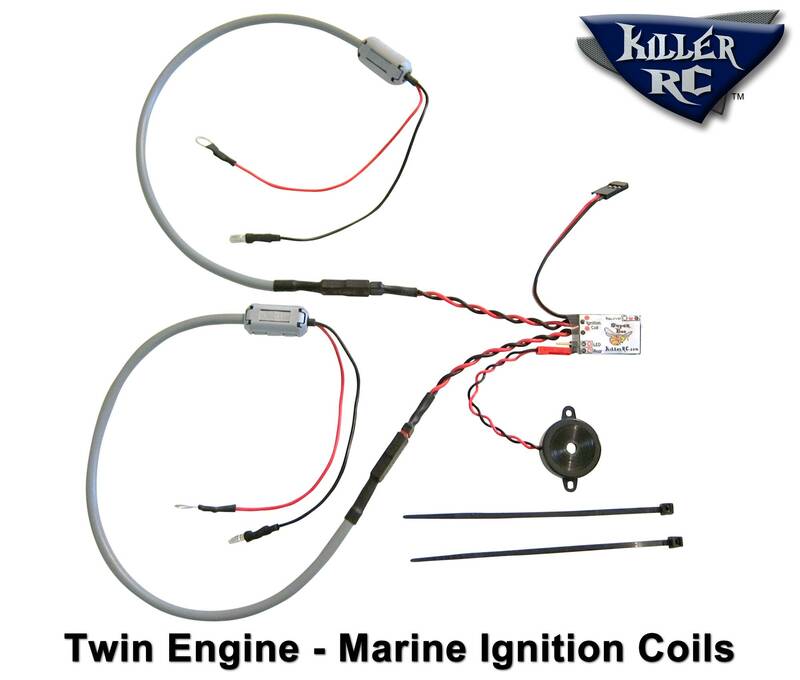 Most boats have a Zenoah style marine ignition coil with an unused black wire coming from the ignition coil. If yours has this then you need to buy a Super Bee boat kit in the Killer RC store. Why put a kill switch on a gas helicopter? A radio glitch or stuck throttle linkage can cause a heli to do severe damage to itself and nearby people. With the blades spinning at such high speeds it’s nearly impossible to safely get to the engine to kill it. This video shows what can happen without a kill switch. The Super Bee boat kit can be installed on most gas Helis. You can adjust the settings on the Super Bee to kill or not kill the engine during a radio glitch. In this video I explain how to use a Super Bee with a 2 channel radio, or a radio with no spare channels. I explain how to use a Super Bee with a 3 or 4 channel radio. The Super Bee comes with instructions about what the dip switches do, but here's a more elaborate explanation. Don't go flipping the dip switches up and down on the Super Bee unless you are sure that you need to change how the Super Bee functions. Most users will not need to mess with the dip switches at all. If you have a 2 channel radio or a LiPo or LiFe battery then you will want to change the settings on the Super Bee. Out of the box the Super Bee is set up for a 3 channel radio with a 4v low voltage cutoff, which is appropriate for a 6v NiMh battery pack. Both dip switches should be up. When you turn on the receiver power you should see 4 amber LED flashes, and 1 green LED flash. Then a solid green LED means the engine is ready to start. Having the dip switches set wrong could cause the Super Bee to prematurely stop the engine while the battery still has plenty of juice left in it. I recently had a customer that had his Super Bee set to a 6v cutoff, but he had a 6v NiMh battery. So that means that a fully charged 6v NiMh battery is barely enough to keep the Super Bee on. If you have a 6v NiMh you want the cutoff set to 4 volts (4 amber LED flashes), so that once your 6v battery gets drained down to 4 volts the Super Bee will kill the engine. Once you have the cutoff voltage set correctly the dip switches also serve a 2nd purpose. Once all the LED flashing is done at startup the dip switches control how the Super Bee functions with your radio. It comes from the factory set with both dip switches up, which is good if you have a 3 channel radio and you have that 3rd channel available for use with the Super Bee. If this is what you have then don't mess with the dip switches. But if you have a 2 channel radio or if you are already using up all 3 channels to control servos then you will need the #1 dip switch flipped down. This turns off Aux control. The Super Bee can now share a channel with one of your servos, using a Y-splitter cable (which we sell in the KillerRC.com store). To kill the engine you just turn off your transmitter power button. This section is taken directly from the instruction sheet that comes with the Super Bee. Instructions and diagrams can be found on the downloads page. This is how to install the Super Bee car kit kill switch in the Losi 5ive. The Losi 5IVE's radio box is kinda small, so I suggest running an extension to the battery box and plug in all your electronics there. 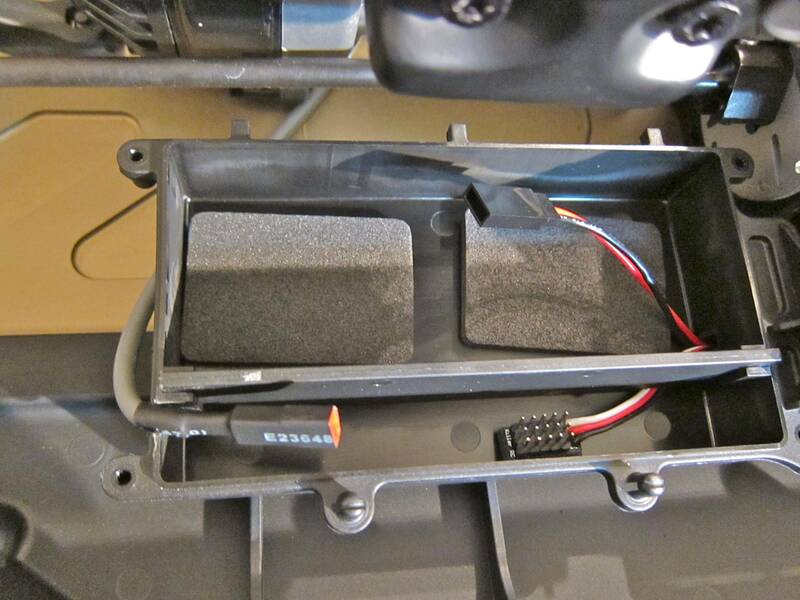 You can use the extra spots on the splitter to power a transponder, LED lights, volt meter, etc. 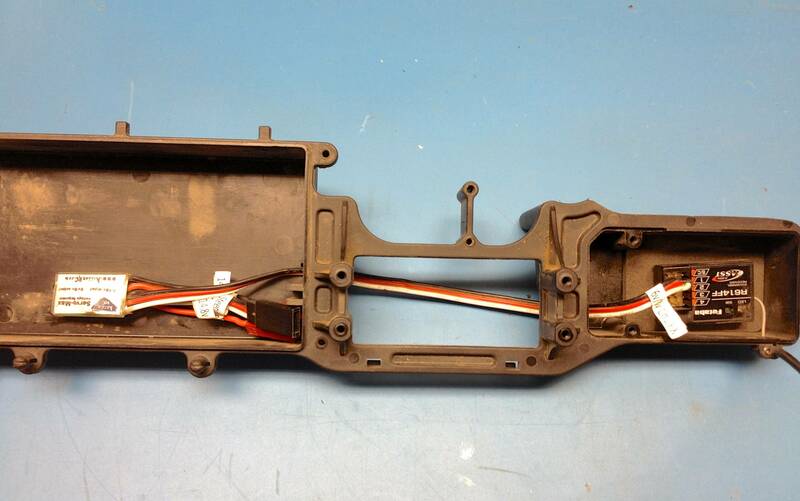 To run the wiring more easily and cleanly I recommend that you take the battery box and radio box loose from the chassis pan by removing the screws underneath. Cut a notch in bottom of batt box divider, for wiring to run under. Cut zip ties. I removed the Spektrum sensors while I was at it. Run wiring from batt box to radio box. Add zip ties. 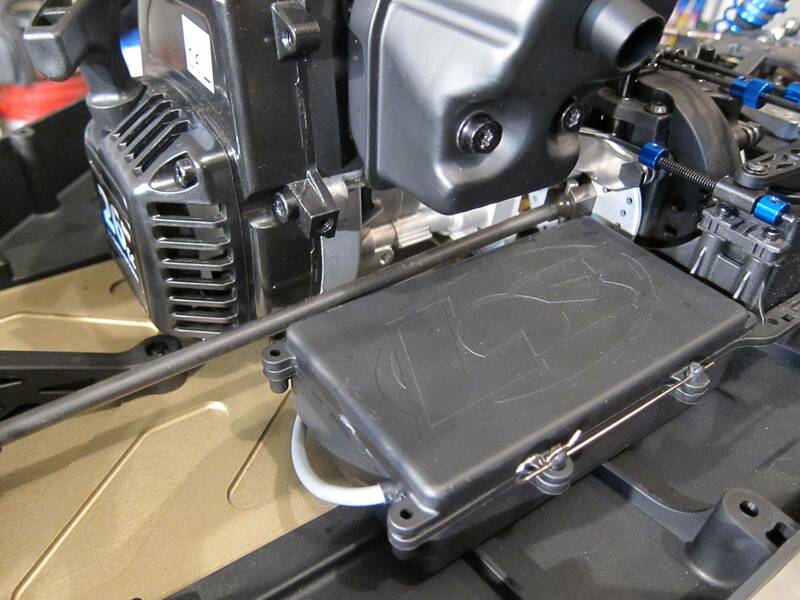 Use a file or Dremel and cut a slot in back of the battery box for the ignition cable. Remove 4 bolts underneath that hold the engine down. Throttle linkage slips loose and disconnect fuel hoses. Its easy to remove the engine in the Losi. It takes like 5 minutes.Take fan cover off. Take ignition coil loose. Remove stock push button. Connect new Killer RC wiring. Reinstall ignition coil. Use a business card to set the gap between flywheel and coil. That gray radio interference filter thing that looks like a big vitamin pill, that can be unclipped and moved further down the cable if you need to. It has 2 clips that pop loose. Just look at it close and you'll see it. Zip tie the cable to the bottom stand-off that the coil bolts to. This will keep the wiring away from the flywheel. Get the red rubber button cover off of your old stock switch and put it on your new switch to keep dirt out of the switch. Put fan cover on engine and bolt it back down to the chassis. 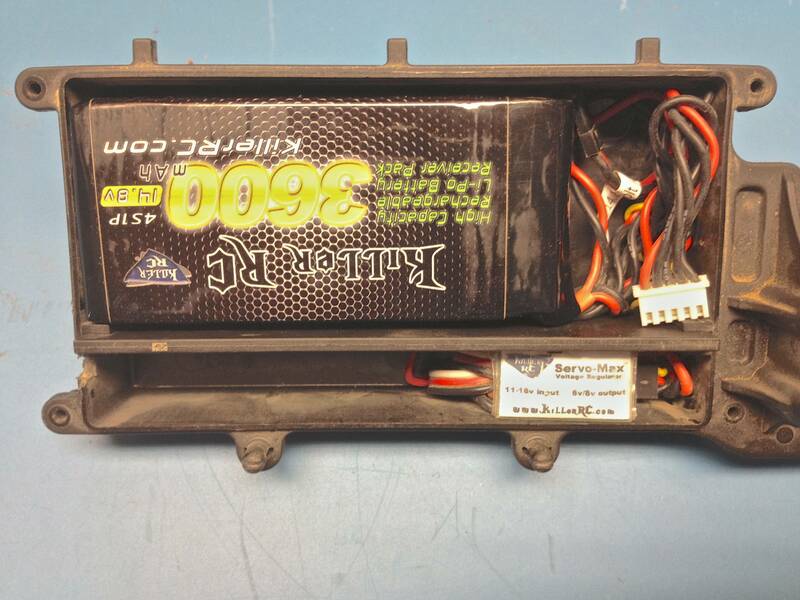 You can also relocate the radio receiver to the battery box if you use a Killer RC 6000 or 7200mAh 7.4v LiPo battery. Most of us have a lot of money invested in our gas RCs, and we want them to be well protected from a dangerous runaway. The Super Bee is the best protection you can add to your gas RC, and to prove it, I'm going to list some of the important features that set the Super Bee kill switch kit apart from the competition. The Super Bee stops your engine: on command via the Aux button on your radio, on command by turning off the transmitter power, low receiver battery, total battery power loss, and during a radio glitch. The Super Bee kit is easy to install, and it comes ready to install. No need to solder or crimp any connectors. Just remove the old push button switch on the engine and install our new one. The Super Bee kit comes with a quick disconnect JST plug on the ignition cable, to make it easy to remove your battery box or swap out the engine. The Super Bee kit has EMI filtered ignition cable, to help prevent radio interference through the cable. The Super Bee is half the size of other kill switches. Its easy to fit in any radio box. The Super Bee works with 2, 3, or 4+ channel radios. You can turn the Aux control feature on or off. No other kill switch can do that. If you want to add a light controller to your 3 channel radio then you can easily do so, and the Super Bee will still work. Just flip down the #1 dip switch, and then the Super Bee will only kill when you have a glitch or turn off the transmitter power. The Super Bee works with 4 to 9 volt radio receiver batteries, so it's 2S 7.4v LiPo compatible. With other kill switches you have to install a voltage regulator inline for the kill switch to work on 7.4v. That's just more stuff to mess with and possibly fail when you need it. The Super Bee has adjustable glitch sensitivity, which is nice if you want to drive at long distances without prematurely killing the engine because of small glitches. Some radios naturally have small glitches, and with this feature you can make the Super Bee "ignore" these small glitches and allow the engine to run, unless a significant radio glitch happens. Twin engine capability. You can turn a regular Super Bee into a twin Super Bee by just soldering in an extra cable (available from us) into the 2 empty holes of the Super Bees circuit board. The Super Bee has 6v LED output that can power up to 50 LEDs, like 4 sets of HPI Baja LED headlights (that we sell). It will make the lights flash when your battery voltage gets low or if your radio has a glitch. Other kill switches can only power 1 LED, or no remote LEDs at all. Buzzer output. The audible buzzer reminds you to flip your radio switch before trying to start the engine. Or it reminds you to turn off the receiver battery once you have turned off the transmitter. Also, the Super Bee kit still comes with the FREE buzzer. Engine Temp sensor module coming soon. So the Super Bee can kill the engine if it gets too hot. Data logging module coming soon. So the Super Bee can send info to your smart phone or computer about your cars: voltage, engine temp, and radio glitches. The Super Bee is available in a car kit, boat kit, or twin engine kit. This makes it plug and play on most any type of vehicle engine. The Super Bee was designed and is manufactured in Ohio, USA. We test each kit thoroughly before packing them up and shipping them out to customers. The Super Bee has a 1 year warranty. We have dealers worldwide. We ship worldwide, Monday - Saturday. We have been making kill switches since 2002, and we are very knowledgeable about RC radio setup, and we can help you with most any issue you might have. We help customers on the phone, email, forums, and Facebook. The Super Bee fits most all models, as long as they have an ignition coil like this. The 4PL is aimed at the RC Rock Crawling community with special features and programmed mixing function offering 4Wheel Steering with front (independent), rear (Combined) and crab walking functions. The radio also offers mixing for dual esc's for vehicles such as the Berg (GV), XR10, old school Clodbuster and many other MOA vehicles on the market. But it would still be an awesome radio for the Baja and other RCs. Like if you want control of the Killer Bee and the Killer Kontroller light controller. Other features offer mixing for independently adjustable front and rear brake controls, which is nice for those of us with front and rear braking servos. The "Idle Up" feature is also included. I use this feature on a cold engine. Works great. Steering (Ch1) and Throttle (Ch2) functions are the same as those available on the 3PM(X) radios with the addition of Idle-up and Throttle speed adjustment. JR R-1 with Spectrum SM1001 module and SM3001 receiver. But this should work with FM too. 1) Turn radio and receiver off. 3) Put radio switches in their failsafe position (brake on, steering straight & idle Up off) and then hold the bind button on the transmitter module and turn radio on. This will bind the units and set the fail safe mode. 3) Toggle the “Idle Up” switch and the Killer Bee switch LED goes out. Toggle the other way and the LED turns on. 4) Turn the radio off and everything goes to the preset fail safe mode that was set when you bound the units together (brake on, steering straight and Killer Bee LED is off). Vintage Futaba T3UCP (aka FF3) radio, circa 1988-89, with a PCM R113i receiver at 40MHZ PCM. It's a proper 3-channel system, but you have to do a couple of adjustments to the Tx settings, otherwise you will end up frustrated, as I did, at first. Problems solved with a quick phone call to hpergm who set his up using the same radio! So... my 3-rd channel can be adjusted to use two switches on the front, at the top of the radio, (the ones previously set up for the lap timer/alarm) one for + one for -, or on and off respectively. However, it either does the + and - incrementally, or acts as a 3 pos. switch or a 2-pos. switch. I had it at the incremental at first and of course it would not kill the engine! Then Hector told me about this somewhat hidden submenu of adjustments, and it was a breeze. Now, it kills the engine with a click. (I should have RTFM(*), of course, first!!!) Just remember which one is the start and which one is the stop! I flooded my engine (of course!) and resorted to the help of my 12 yo son to hold the Baja upsidedown, without plug installed and I was pulling the pullstart downwards... Awkward and funny at the same time! I then reversed the 3rd channel to have the stop button at the button that says "Alarm stop". All's fine now! Then I activated the Tx failsafe so that when you turn off the transmitter, the 3rd channel goes to "stop". Setting Up a JR XS3 and Super Bee, V1 Killer Bee Killswitch, or light controller. 1.Press the Scroll and Channel keys at the same time and hold. 2.Turn on the transmitter power switch to enter System mode. 3.Press the Scroll key until “AUX” appears on the screen. 4.Press the Increase or Decrease key to select the correct Auxiliary Channel 3 function type to be used. You want to keep pushing the Increase or Decrease keys until “2P” appears on the screen. 5.Press the Scroll key to access the Grip Button C Select function. 6.To exit the System mode, either turn the transmitter power switch off or press the Scroll and Channel keys at the same time. Now it is time to check to make sure Grip Button C is setup for activating the killswitch. If you are a racer and want to use the lap timer function, then ignore this step as it will override the lap timing function. 3.Press the Scroll key until “GBC” appears on the screen. 4.Press the Increase or Decrease key to select the correct Grip Button C function type to be used. When the screen displays “2P” you can exit the setup. 5.Press the Scroll key to access the Data Reset function. Next its time to make sure that the EPA of channel is at the right setting. I did a little experimenting with my radio, and if the EPA values were set too closely together, the Killswitch would not shut off the engine. So long as the EPA is between 0 and 100 everything worked just fine for me. (My memory of this section is a little foggy, so if the steps seem to be a little off it is my fault). 1.Turn on the transmitter power switch. 2.Press the Scroll key to enter Function mode. 3.Press the Scroll key until “EPA” appears in small letters on the left side of the screen. 4.Press the Channel key to select the desired channel to be adjusted. 5.Move Grip Button C in the desired direction for adjustment. Press the Increase or Decrease key to achieve the desired amount of travel. Move Grip Button C in the opposite direction to adjust the travel in the opposite direction (I would guess you should just click the button again? I don’t really remember what I did for this step). 6.To exit the Function mode, either turn off the transmitter power switch or press the Scroll and Channel keys at the same time. It doesnt have SW preset but I think it can be configured to work as one. Maybe to setup #3 as +100% as neutral (default) position in which would give KS an "OK" status and then setup positions #1 and #5 to 0% so both AUX + and AUX - buttons on remote can be used to kill the engine. The HPI 3 channel FM radio that came with older HPI Bajas is a simple radio to use. No radio setup involved. Just flip the switch by your thumb on the grip of the radio. Look for a solid green light on the kill switch before you start the engine. The HPI TF-20 2ch radio comes with some of the older HPI Bajas. This radio is very poor quality, plus it won't work with any brand or model of kill switch because if how they designed the receiver It's best to replace this radio with something like a Futaba 3PM-X, or 4PLS and then you can use a kill switch and/or light controller. How to set your Airtronics M11's Aux channel to control a Super Bee, v1 Killer Bee kill switch, or light controller. You must re-bind if you are changing from 2 channel mode to 4 channel. If its already on 4 channel then you're good. Notice the red box on the very right. It must be at 100. If yours is not at 100 then go to DIAL on the left of that same screen, and change the steps to 1, now spin the dial and those numbers on the right should start going up; take it up to 100. Once this is done change your DIAL steps back to 200. If you don't like to use the DIAL to control the kill switch then you can also use Trim 3, 4, or 5. Here is a review on my new Futaba 3pl hooked up the other day. Really great radio for the $. I use it in my HPI BAJA 5b 2.0 . The main reason for the purchase is to run the Killer Bee V1 kill switch. The radio is a 3 channel + 1. The +1 is for hooking up front brakes on 1/5 scale to work in conjuction with the throttle/brake servo or for duel steering of the rear wheels. Everything on the controller is pretty straight forward with it's easy to read LCD with custom 3digit naming up to 10 RC's. 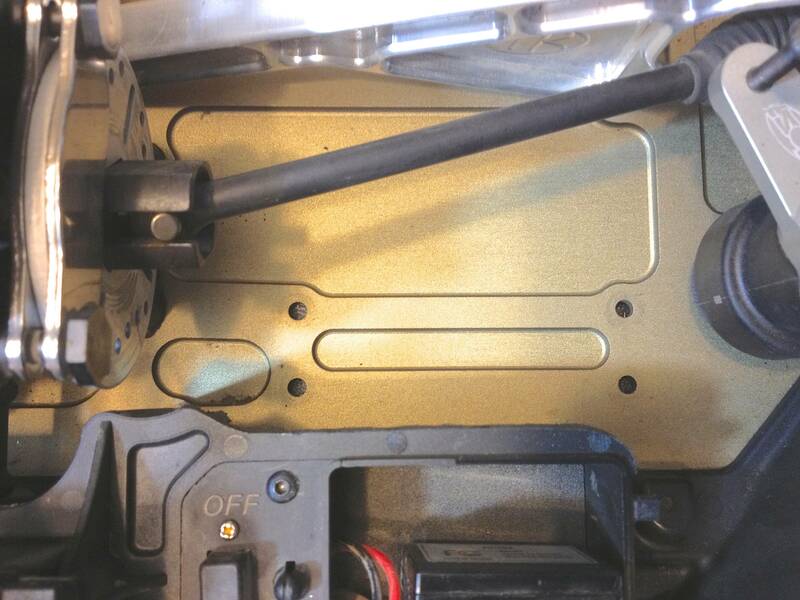 You can add and remove trim in the different servo settings throttle and steering. I was able to add some extra steering to the right up to 120% easy which helped turn in over the stock radio. It also comes with a failsafe that works great and easy to turn on or off. The abs brake function is golden! It has 3 settings & I set it to med and now when I run it on the street I could stop easily and straight as an arrow. Really nice feature to keep you from having to modulate the brakes yourself or keep the car from spinning around on you and potentially rolling. The icing on the cake was the Killerbee V1 killswitch that came with the optional led and the stop engine button pre-wired to hook up to it. For the settings for the transmitter I just had to adjust the 3rd channel switch to Reverse on the side of the transmitter. The rest of the pre settings in the transmitter for the 3rd channel was set to Normal and the trim to 100%. The great thing is to kill the engine I just switch the 3rd channel switch on the side of the transmitter to Normal and bam it kills the engine without the failsafe coming on. If you want the failsafe to come on which would be to full brakes just simply turn off the power button on the 3pl and bam the engine is killed and failsafe on. Anyway these are both great products combined together and I recommend it to anyone that doesn't need all the extra features of bigger more expensive radios and it works great with my Killer Bee V1. The 3PL is a great radio for the money. FYI, that 4th channel on the 3PL is not really a full function 4th channel. I think its kinda just for rear steering on a rock crawler. For a full function 4 channel radio you would need the 4PL or 4PKS. The 3PL aux button can control a Super Bee, V1 Killer Bee, or Light controller. Aux control only works with a Super Bee or v1 Killer Bee or Light Controller. Plug kill switch in Aux spot on receiver. Plug battery in Bind spot if there isn't a Batt spot. Trim the little tab off of the kill switch plug so it will plug into the Spektrum receiver. To set your Aux channel to control a kill switch or light controller do this: Use the scroll button to get to the AUX screen and use increase to get 2P on the screen. Shut off the transmitter. Now you have to bind the transmitter and receiver. Put the receiver into bind mode by pressing the blue button down while turning on the power to the receiver at the same time (turn on switch or plug in battery, depending on how you have your system set up) once the receiver is in bind mode (LED flashing), you have to put the transmitter into bind. Here is where it gets tricky, because you have to set your brake preset and killswitch preset in the event you loose transmitter signal to the receiver. So, while holding down the bind button on the rear of the transmitter, put your brake in the desired "failsafe" position. While holding both, turn on the transmitter. As soon as you turn it on, click the "C" button, or third channel button, and the transmitter should "beep". (note, you only have to press the "C" button once and let go, you do not need to keep holding it during binding) Once the LED on the receiver stops flashing and stays lit solid green, binding is over and you can let go of your buttons. Now test the 3rd channel function by pressing the "C" button. Your killswitch led should turn on and off. With the killswitch LED on, turn off the transmitter. The LED on the Killer Bee should flash for a second, then shut off. The Super Bee light should turn red. If this does not work, try to rebind as stated above. If this still doesn't work, try to rebind, but this time don't press the "C" button during the binding process and retest the killswitch function when the radio is shut off. If all went well, you should now have your killswitch working off the "C" button, as well as when the transmitter is shut off. Instructions for setting your Aux channel to control a Kill Switch or Light Controller. Ok, now onto the radio setup. On a new 3PM usually the 3rd channel is not assigned to any buttons, so basically the 3rd channel is dead. Most guys choose to use the SW2 button to control the Aux channel. The SW2 is the big sliding button in front of the steering wheel, by the small edit buttons. But first you need to go into the System menu and set it up. You have now just assigned switch SW2 to now control Channel 3. Now the big button in front of the steering wheel should be able to turn the kill switch on and off. Update* If you have a 3PMX make sure you have the 4WS (4 wheel steering) turned off, otherwise the 3rd channel menu will not show up. This video shows a guy setting up his 3PMx to be used as a 3 position switch for rear steering on a rock crawler. In this video he is using the trim buttons, but for a kill switch you probably want to use a simple 2 position switch like the SW2 button in front of the steering wheel. Anyway, you can watch this video just to see how to enter the System menu. Once you have the Aux channel all set up I recommend that you set the built-in failsafe on the Futaba receiver for extra protection. This process is explained in the Futaba manual. You want to hold the Aux button in the off position while you set your failsafe mode. When your failsafe is properly set the Super Bee light will turn red. The Killer Bee light will turn off when you turn off the transmitter power. If your failsafe is not set then the Killer Bee light will flash. The result is the same; the engine will die. But its best if the LED turns off instead of flashing. This means that you have two levels of safety protecting your RC; the radio failsafe and also the Killer Bee. You can use the Aux button on the dx3S to control a Super Bee kill switch or a Killer Kontroller light controller. First make sure you have a Super Bee or a V1 Killer Bee (Killer Bees are discontinued) if you are wanting to kill the engine with the Aux button. The old V2-S Killer Bee is designed for 2 channel Spektrums or when you are using your Aux for something else, like our light controllers. On the DX3S the Aux button is to the left of the steering wheel. You want that button to kill the engine or activate the light controller. Plug kill switch in Aux spot on receiver. 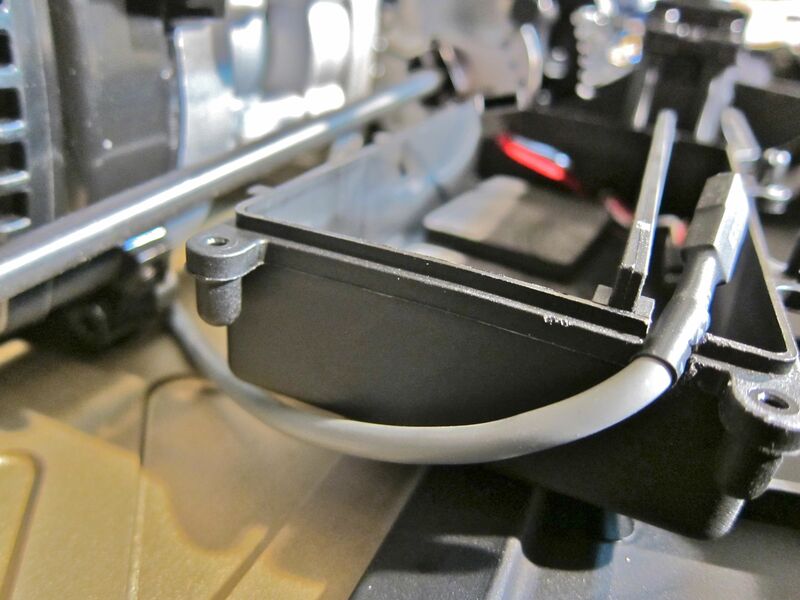 Plug battery on/off switch into the Bind spot if there isn't a Batt spot on your receiver. Trim the little tab off of the kill switch plug so it will plug into the Spektrum receiver. When you turn off the transmitter power the Super Bee light should turn red. The Killer Bee LED should flash for a second and then turn off. If the LED turns off and then turns itself back on then the Spektrum failsafe is overriding the Killer Bee. To fix this just flip the Aux switch so that the Super Bee light is red. Hold it in this position (engine killed) while you rebind the receiver and transmitter. This should now fix the issue and the Super Bee light should turn red when you turn off the transmitter power. The binding process is covered in the radio manual on page 16 I think. I've never used a Ko Propo radio. Maybe somebody else will chime in. I believe you just go into the Aux menu, and choose one of the buttons. Possibly the BT1 button by the thumb? Then when you press that button it should kill the engine. If you have to hold the button down to make the LED go solid green on the Super Bee then that means that the channel needs to be reversed. So just go to the Reverse menu and change the setting on the Aux channel. Now the Super Bee LED should be solid green, except when you hold down the BT1 button, which makes the LED on the Super Bee turn red and kills the engine. To control a Super Bee, Light controller, or v1 Killer Bee with the Aux button on your MX3 or MX3X basically all you need to do is set AUX channel EPA to maximum at both ends, which is 150%. Then just press the Aux button to turn your kill switch on or off. The Aux button is usually the button thats above and right of the steering wheel. On the MX3X make sure you have "channel mixing" turned off. Usually no setup is required on that radio. Just plug the Super Bee into your Aux spot on the receiver and then flip your Aux button on or off at the transmitter. But if your Aux channel still isn't working then read this. The Aux button is the little flush button by your middle finger, below the trigger. On page 11 of the FlySky manual it's button 3. It's not button 6. Pressing button 3 should turn your kill switch on and off. If it doesn't, go to the Trim menu for channel 3 and increase it all the way to 30, I think? Then go to the End Point adjustment menu for channel 3 and increase that to 100. To make the Super Bee light turn green as soon as you turn on the transmitter power you can use the REV menu on channel 3 to change it. Make sure the Super Bee has both dip switches UP, and its plugged into the Aux channel of the receiver. This is the latest version of the radio that HPI includes with RTR HPI Bajas. I think this radio was issued in late 2012. Some older HPI radios won't work with a kill switch, but this newer version will work. You just have to change some settings on the radio. See below. If the Transmitter you have was originally for an electric car or truck the factory setting on the fail safe will be for neutral throttle. -Quickly push the channel 3 button and move throttle to full brake position -Still holding throttle press and hold set up again until the red led flashes rapidly This will set fail safe to turn on the kill switch and apply full brake. If you don't want full brake applied skip the throttle step. Basically, when you turn off the transmitter power you want the Super Bee light to turn Red. If it turns Green then follow the above steps to change it. FYI, since the #1 dip switch on the Super Bee or Bumble Bee has to be UP for it to work with this radio, you cannot use a light controller in conjunction with a kill switch. You can only use a kill switch or a light controller, but not both, like you can with most other 3 channel radios. Menu 2 to get access to setting up switches. Also should set your Failsafe - it now supports failsafe with based a set battery voltage as well as range. This feature like it big brother the 4pks and 4pks-r.
You see you will set you servo position on failure by clicking middle button on your transmitter. I recommend centering your wheels and in moderate brake position. Here is picture of the transmitter's top level screen, Note you can see Transmitter and Receiver battery voltages. ( T 5.6 volts, R 8 volts) You do not need a separate s.bus telemetry sensor to support this, just the receiver. " Plug kill switch in Aux spot on receiver. Plug battery in Bind spot if there isn't a Batt spot. 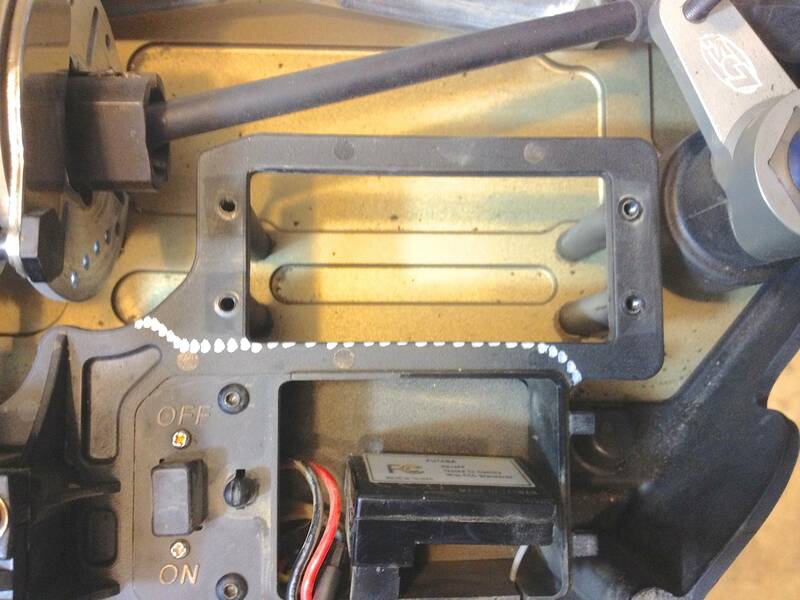 You may need to trim the little tab off of the kill switch plug so it will plug into the Spektrum receiver. For a kill switch you need to keep the Spektrum failsafe from overriding the kill switch. Hold the C button in the off position while rebinding the tx and rx. The Super Bee light should turn red, or the V1 Killer Bee light should now turn off when you turn off transmitter power. If you have a newer Spektrum radio that has AVC, you need to disable the AVC to get your radio to work properly with a kill switch or light controller. To my knowledge, there is no way around this. It's an issue with how Spektrum designed the radio. AVC disables channels 3 and 4, and also makes the receiver's failsafe operate in a way that keeps the Super Bee from seeing when a radio glitch happens. Be sure to set the Failsafes the way you want them if activated. That means you need to follow the React Manual. I made sure the Throttle was neutral, Steering centered, Power to the Kill Switch off and Lights off. Then send the setting to the receiver. Test by having the system on and turning off power to the transmitter. The kill switch light should go off killing power to the Baja. I used a “Y Harness” to the Power/CH4 slot on the receiver for lights. You can use a Super Bee, V1 Killer Bee, or V2S Killer Bee with the DX3C/DX4C, but if you want to kill the engine with an Aux button then you need to use a Super Bee or V1 Killer Bee. The Super Bee is the newest and best kill switch. You can also use this setup to control a Killer Kontroller light controller. Plug the Super Bee or V1 Killer Bee into the Aux spot on your receiver. You will have to cut off the little tab on the Killer Bees plug, because we use Futaba style plugs. Plug your Power switch into the Bind spot on the receiver. You should now be able to turn the kill switch LED on and off by pressing the A button by the steering wheel. You want a solid green LED on the kill switch before you try to start the engine. If you want to change the direction of the radio button then just go to the Reverse menu on the radio and change the direction. Now test your radios failsafe setup. With transmitter and receiver turned on, turn off the transmitter power. The Super Bee LED should flash for 5 seconds and then go solid red until you turn the radio on again. If yours does this then you are good to go. With the transmitter power left off, If your Super Bee light flashes for 5 seconds and then goes to solid green by itself then you need to change the setup of your failsafe because its overriding the kill switch. Setting the failsafe is covered in the Binding section of the Spektrum manual, page 9. With transmitter On, remember which direction turns the Super Bee LED red, up or down. Lets say that down is LED red. Turn off transmitter and receiver. Plug power switch into Steering channel temporarily. Plug bind plug into the bind spot on receiver. Turn on receiver power. Receiver light should be flashing. Turn on transmiter. Scroll down to Bind mode. Hold the A button down while you select the Bind option on the screen. It should now be set. Plug power switch back into the Bind spot. The Super Bee LED should flash and then stay red when you turn off the transmitter power. 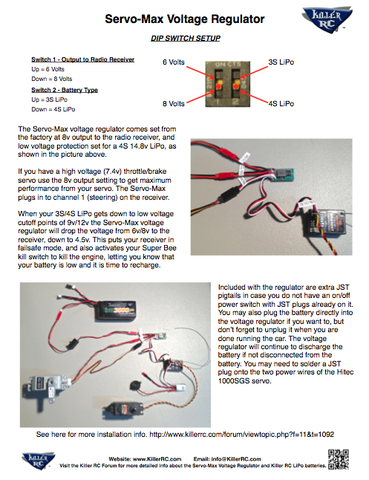 This is instructions on how to get the Futaba 4pk to control a Super Bee or v1 killer bee or light controller. I like to use the PS2 button on the grip. Its a momentary switch. When you press the button the engine will die, and then when you release the button the engine is ready to be started. But if you don't like the PS2 button you can use this same method to set up one of the other switches. For controlling a light controller you might want to use the top button, or the button under the steering wheel. I also recommend that you set your failsafe. Go to the F/S screen, get the arrow down to the 3rd channel section shown in this picture, then hold down the 3rd channel switch (PS2 is the button on the grip), and press + and - at the same time. The screen should say -75%, or a similar number. Now test it to see if it kills the engine when you turn off your radio power. If the engine does not die then you have the failsafe set up wrong, and it's fighting against the kill switch. If the engine dies then you're good. Also notice at the bottom of the screen I have the radio set up so that the throttle servo goes into failsafe mode and applies the brakes once the receiver battery pack gets down to 4.75 volts. First make sure you have a Super Bee or v1 Killer Bee. A v2/v2S Killer Bee won't respond to Aux trim commands. If you have never used your Aux channel before then the Aux channel probably isn't activated. The aux channel is just sitting there "dead" waiting for you to tell it what to do. The 3PK 2.4ghz FASST is very similar to the 4PK. You just need to go to the Switch menu and pick a button and then select the 3rd channel. You might have to reverse the 3rd channel to get the kill switch to stay on. On the right hand side of the screen you'll see NOR. If you switch it to ALT that switch will change how it works. Like a momentary switch, or a permanent switch. The Killer Bee light should be solid green before you can start the engine. With a 3PK with a Spektrum module the setup will be about the same. Just make sure that you set the failsafe properly. The light on the killer bee should turn off when you turn off the transmitter power. The Super Bee light should turn red. If the light turns off but then turns itself back to solid green then your failsafe is set backwards. During the binding/failsafe setup be sure to hold the 3rd channel in the off position. Then test your results. The "C" trim button by the steering wheel should now turn your headlights or kill switch on and off when you flip the switch back and forth. Now test your Spektrums built-in failsafe. With transmitter and receiver turned on, turn off the transmitter power. The Killer Bee light should flash for a second and then turn off. The Super Bee should turn red. If your Super Bee or Killer Bee light flashes for a second and then stays on solid green then you need to change the setup of your failsafe because its overriding the kill switch. Setting the failsafe is covered in the Binding section of the Spektrum manual, page 9. With transmitter On, remember which direction turns the Killer Bee light off (Super Bee light red), up or down. Lets say that down is LED off. Turn off transmitter and receiver. Plug power switch into Steering channel temporarily. The Killer Bee V1 LED should now turn off when you turn off the transmitter power. A Super Bee LED should turn red. If you have a newer Spektrum radio that has AVC, you need to disable the AVC to get your radio to work properly with a kill switch or light controller. To my knowledge, there is no way around this. It's an issue with how Spektrum designed the radio. If you have a v2s Killer Bee then all this above info is useless, except you will still need to use 11ms Frame Rate if you plug the V2s into your Aux channel. You can only kill the engine via the Aux channel if you have a v1 Killer Bee, or Super Bee. This is setup info for the Super Bee kill switch or Killer Kontroller light controller to work with the Aux channel on your DX4S. Plug the on/off power switch into the Bind spot on the receiver. Trim the little tab off of the kill switch plug so it will plug into the Spektrum receiver. Plug the Super Bee into the Aux spot on the receiver. Check to make sure you have the Super Bee plugged in properly. The black wire on the Super Bee is lined up with all the brown wires. Leave Super Bee dip-switch settings on the default settings, unless you have a LiFe or LiPo battery and you need to increase the cutoff voltage. The DX4S Aux channel setup is real similar to the DX3R. Disable AVC, if your radio has this feature. That's it. When you press the A button up or down it should turn the Super Bee on or off. A solid green LED on the Super Bee = Engine can be started. If the Super Bee light doesn't go to solid green automatically when you turn on the radio power, go to the Reverse menu, and flip the setting on the Aux channel. Now you want to test the Super Bee. Turn off the transmitter power. The Super Bee should flash red/green, and then go solid red. If it goes solid green then you will need to change how the failsafe is set on your Spektrum receiver. This is covered on page 10 of the owners manual. While binding you need to hold the A button in the off position (Super Bee LED red), and then on the menu screen click the Box around the big word BIND. That should do it. You can now let go of the A button. Turn off the receiver power, unplug the bind plug, and then power everything back on and turn off the transmitter power to see if the Super Bee LED goes solid red and stays red while the transmitter power is off. Congrats if you have this radio. It's not cheap, but it's awesome. I recommend you sit down and read through the manual, and just play with the radio and get familiar with how the menus work. There are multiple pages of menu screens. Setting up a kill switch or light controller on channel 3 or 4 is real easy. -Press main round edit button to pull up the menu and then press the + button to go the 2nd menu page. -Choose the button you want to control your Aux channel. I like to use the PS2 button. It's the chrome button right by your thumb on the grip. You could also use the PS1 or PS3 buttons. -Then go to the Fail-Safe menu and turn the Aux to OFF, so that it doesn't try to override the kill switch. If your kill switch is staying in the kill mode (red flashing) unless you are pressing the PS2 button, then you just need to go to the Ch Reverse menu and change the direction of the Aux channel. I have a 2 channel radio. Can I use a light controller? Yes, but not with full functionality. It's best to have a radio with a spare channel. Then you can use the Aux channel to switch through the 11 different headlight and strobe light modes. 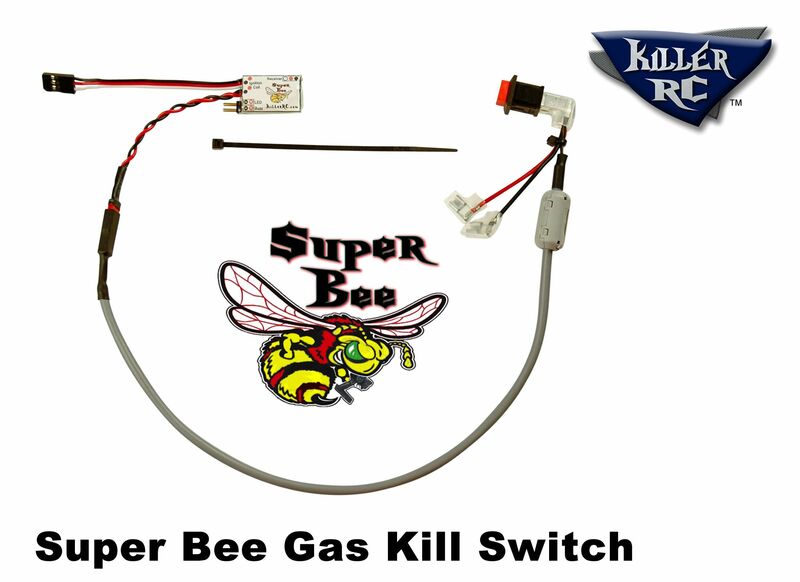 If you want a kill switch for your gas RC, plus a light controller then you will need the Super Bee gas kill switch. 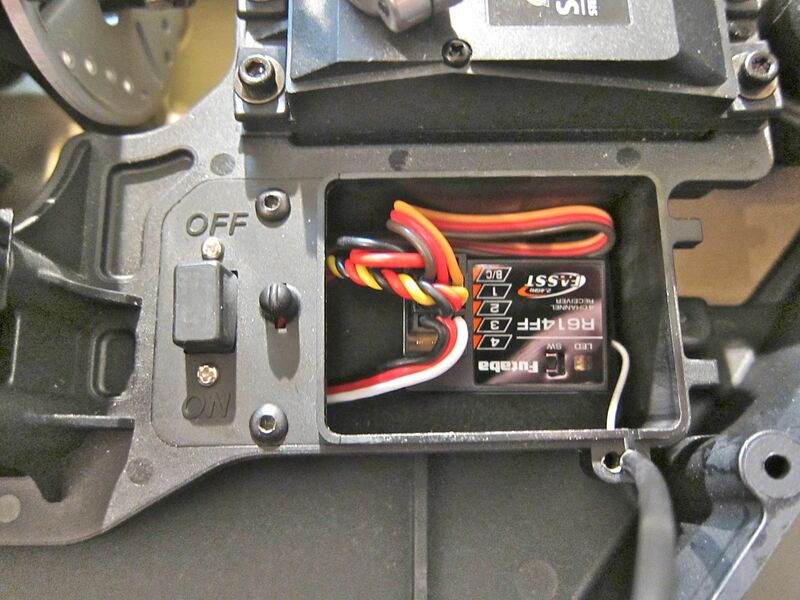 For info on how to setup a light controller plus a kill switch please visit the Killer RC forum or email us. Note: You cannot use a light controller and v1 Killer Bee (discontinued) kill switch on a 3 channel radio. If you have a 3 channel radio and a light controller, and you want a kill switch, you'll need a v2 Killer Bee or the new Super Bee kill switch. Or having a 4 channel radio is even better. Then you can use whatever kill switch you want on the 4th channel. This "plug & play" Light Controller allows you to easily control LED headlights, brake lights, marker lights, and turn signals on your RC car. The Killer RC Killer Kontroller goes in between your radio receiver and your servos. Use your 3rd channel to switch through 3 headlight modes; off, low beam, and high beam. This light controller is compatible with any 3 channel radio. 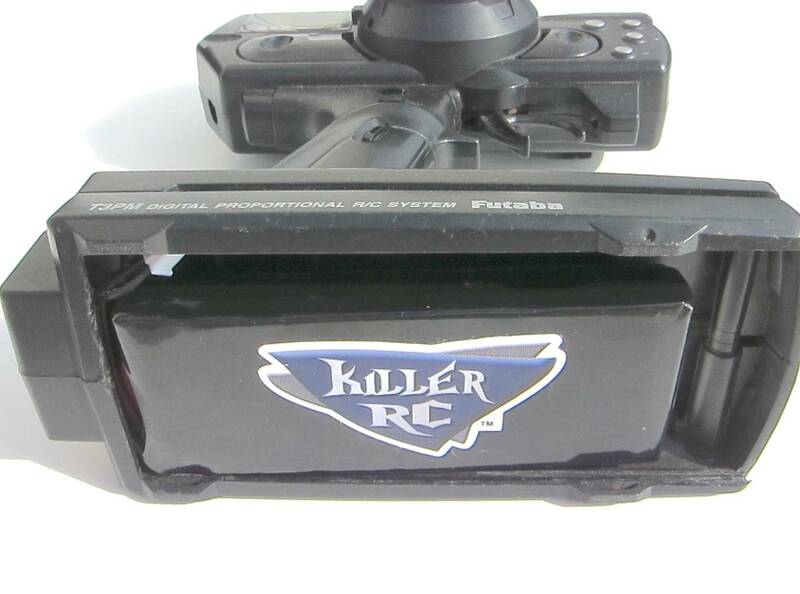 The Killer RC light controller can also power a set of 2 tail/brake lights. When you apply the brakes on your transmitter your tail lights will light up and become brake lights. You can also make your tail lights function as turn signals. As you steer the car the tail lights will flash which ever direction you are turning (This feature can be disabled). The Killer RC light controller also has an always-on marker light output, which can be used for UnderGlow lights or whatever you want. Connect a v2 or v2-S Killer Bee to the Aux output on the light controller, and then you can kill the engine by turning off the transmitter power. The Killer RC light controller can also be used with 2 channel radios but the headlights will be constantly On until the receiver power switch is turned Off. Another cool feature we have added is that the headlights will automatically start flashing when your battery voltage gets low (4.0v), alerting you that you need to recharge the battery pack. This light controller operates on 4 to 12 volts, but whatever voltage your battery is, that is what the light controller will put out to your LED lights. Six volts is the usual application. This light controller is compact in size, doesn't get hot, and can be used on many gas, nitro, and electric RCs. 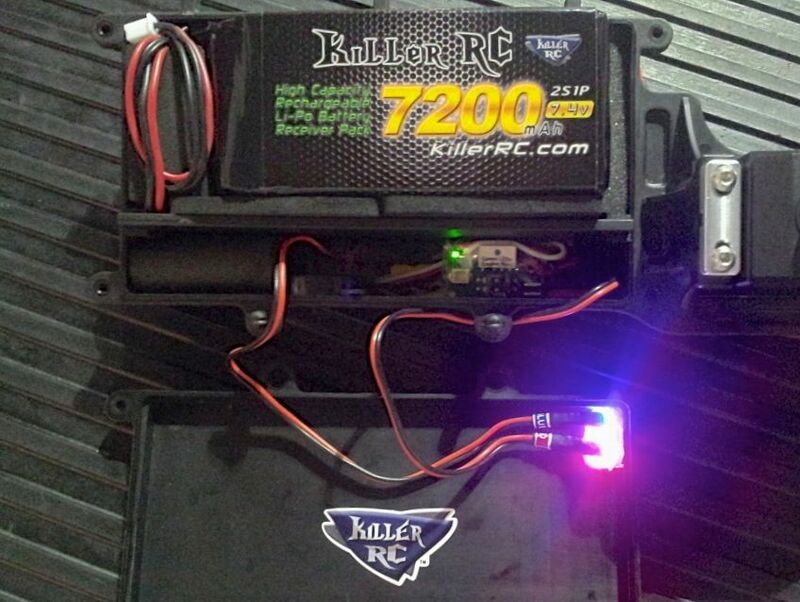 We will soon post up an Installation Video for the Killer RC Light Controller. How do I remotely turn LED lights on and off? You need a light controller, like the Killer Kontroller v3. You cannot just plug your lights directly into the radio receiver; your lights would just be On all the time. Using the Killer Kontroller v3 you can choose from 8 different light modes by just pressing the Aux button on your transmitter. I lost the instructions to my Killer RC light controller. Can you help? Yes. Please visit our Downloads page. Installation of the Killer Kables is pretty simple, but there are several ways it can be done. It can vary depending on the setup of each Baja. So it's kinda up to you. The short cables go in front. Long cables in the rear. I included plenty of hardware. You probably will only use about half the hardware. It just depends on what shock towers you have, and if you use sway bars or not. You can reuse some of the stock HPI bolts too. I included 4 black plastic bushings. They go on the bottom bolts, to compensate for the smaller 3mm bolt that is used. Keep the bottom bolts a little loose to allow the eyelet to spin back and forth a little bit. If you don't use sway bars the included 3mm nylock nuts will keep the bolt from backing out of the arm. You can install the cables inside the arms or outside of the arms. Do whatever gives the cable the straightest route from shock tower to lower arm. On the front you might have to run the cable outside of the arms, instead of inside of the arms, like I did in my pictures. RPM arms work great. With stock arms there will be a little rubbing of cable. It doesn't hurt anything though. If you have stock arms I recommend that you have your arms forward as far as possible. If you have not done this already, remove the black plastic clip on the back side of the top hinge pin, push the arm forward, and put all the clips on the front side. Also, I included two 4x40mm bolts, in case you want to do the rear shock tower mod while you're at it. You simply drill through the plastic and use a longer bolt and then a nut. In this picture you can see the black nut on the front side of the tower. The older Ramtech arms have a shock mounting location that is a little closer to the bulkhead than the mounting location of the stock arms. This steeper shock angle causes more suspension droop. More droop causes bones to get spit out more often. The Killer Kables will shorten up some of that droop, and prevent this baja from throwing bones again. The 4 black nylon bushings go on the bottom bolts. They are not absolutely necessary to use, but they will take up the "slop" in the bottom eyelet. The bushings will fit tight on the 3mm bolt. You may need to hold the bushing with pliers and thread the bolt into it. Do not overtighten the bolts. Once mounted, the eyelet should be able to spin back and forth if you push on it with your finger. After installing the cables it's important to make sure the cables are as straight as possible. If there is a bend in the cable at the eyelet then you need to push on the eyelet and bend it straight. Check all 8 eyelets. This step is very important. If there is a sharp bend in the cable it can cause the wires to crack and eventually break. 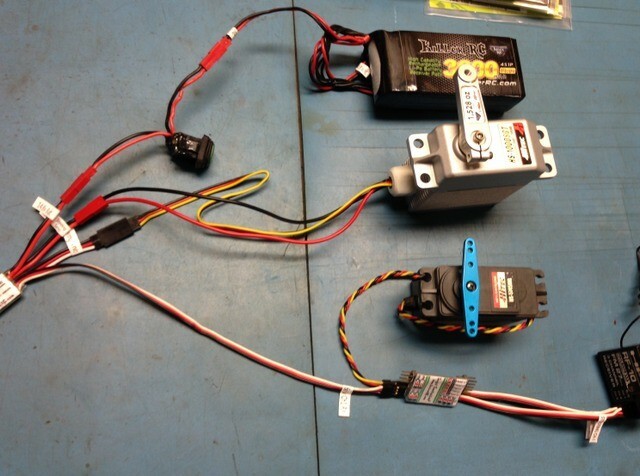 This is how to install the Hitec 900SGS/1000SGS servo and the Killer RC Servo-Max voltage regulator and 14.8v LiPo. 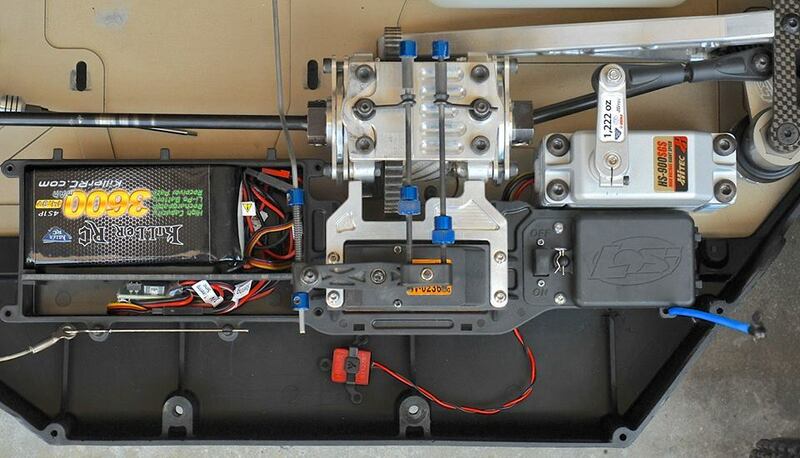 This is the ultimate steering and battery setup for the Losi 5IVE. 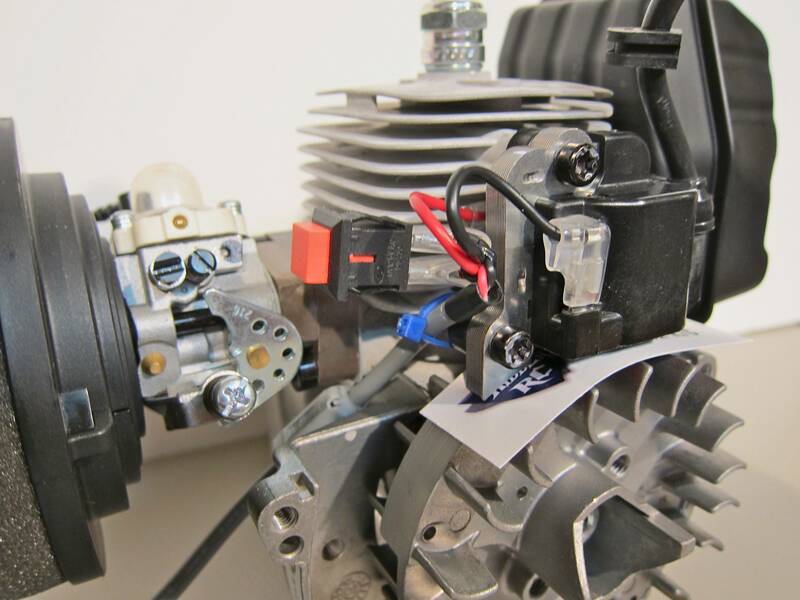 The Hitec 900SGS/1000SGS has the power of 4 servos in 1. It is totally different than any other servo out there on the market. The Hitec servo has full metal gears, and a full aluminum case. This servo mounts simply, easily, and very solidly in the Losi 5IVE, and also allows you to keep your factory battery box and radio box, which keeps your electronics clean and protected. The Hitec servo is very different than other servos. 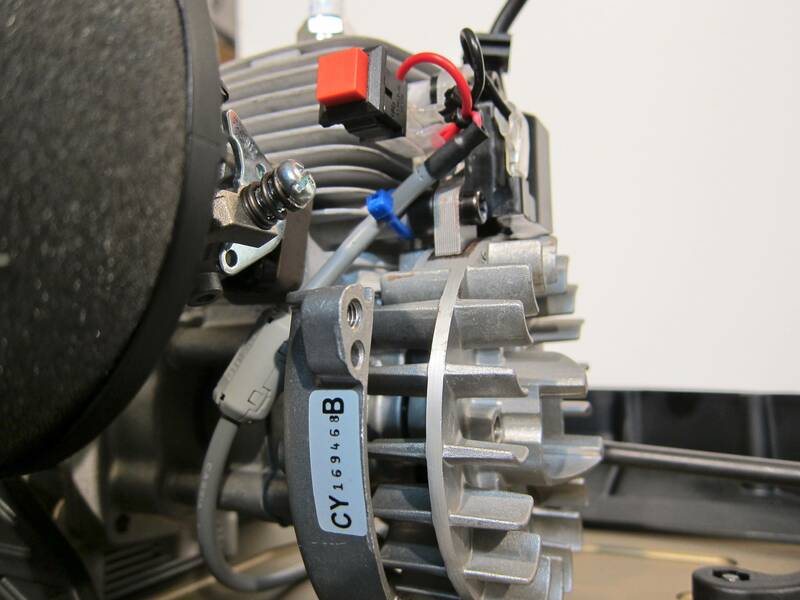 Because it has so much torque it's geared really low, and to overcome the slow movement of low gearing this servo needs a real fast motor, which requires a 14.8v 4S LiPo to power it. 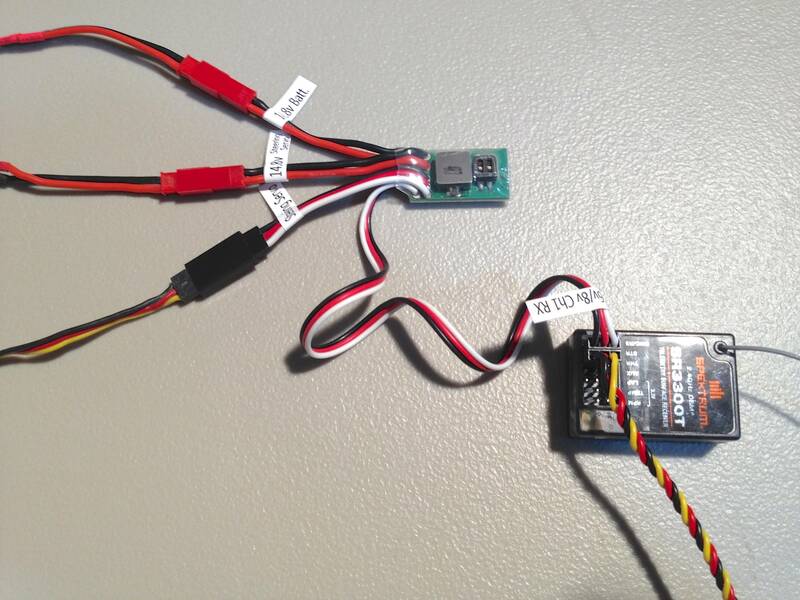 You could also use a 3S LiPo but the servo won't be as fast or as strong. So I have designed a clean simple setup that lets you power this beast of a servo, plus still get a solid 6v or 8v to your radio receiver and throttle servo, and also have low voltage protection for the LiPo battery. 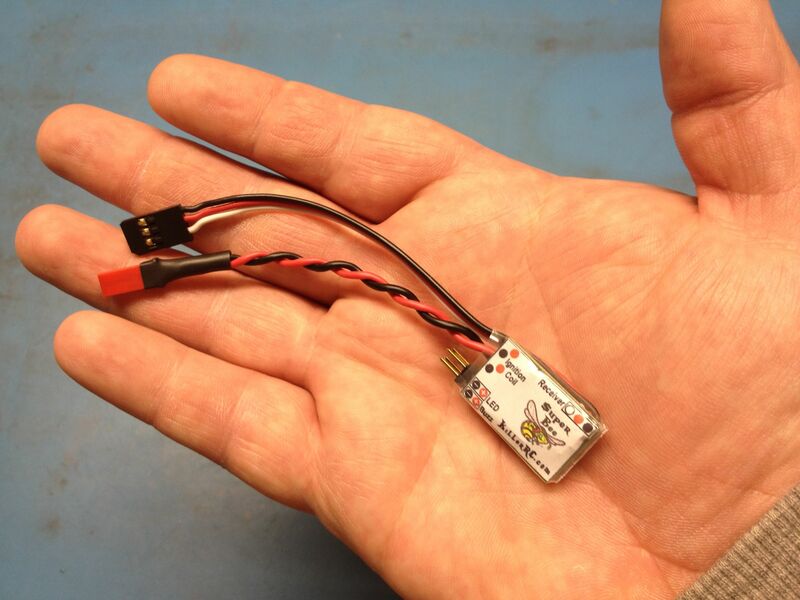 Note: The Servo-Max voltage regulator is only warrantied when used with a Killer RC 4S LiPo. Installation is pretty easy. It should take 60 to 90 minutes. The only soldering you may have to do is to solder on a JST plug onto the Hitec servo's bare power leads. And you may also need to solder on JST plugs onto your on/off power switch wires. These JST pigtails and heat shrink are included with the Killer RC Servo-Max voltage regulator. Simply solder the two wires together, slide on the heat shrink, heat with heat gun. The Servo-Max has selectable 6v or 8v output to your radio receiver/throttle servo. The Servo-Max also has low voltage protection built-in for 4S or 3S LiPos. More detailed instructions are included with the Servo-Max. 14.8v LiPo Battery to on/off switch. On/off switch to volt regulator. Volt regulator long pigtail to Ch1 (steering) spot on the receiver. Throttle servo to Ch2 (throttle) on receiver, as usual. Super Bee kill switch to Aux channel, as usual. Hitec 900/1000 SGT servo's main 2 power wires and also the 3 wire pigtail from the servo will plug in to Servo-Max volt regulator. The Batt/Bind spot on the receiver will be empty. Only the wires with red JST plugs will have 14.8 volts flowing through them. The cables with JR/Futaba plugs will have 6 or 8v flowing through them. Be careful which on/off switch you use. Some switches may not be compatible with 14.8v. Remove stock steering servo, and remove tray from chassis of Losi 5IVE. 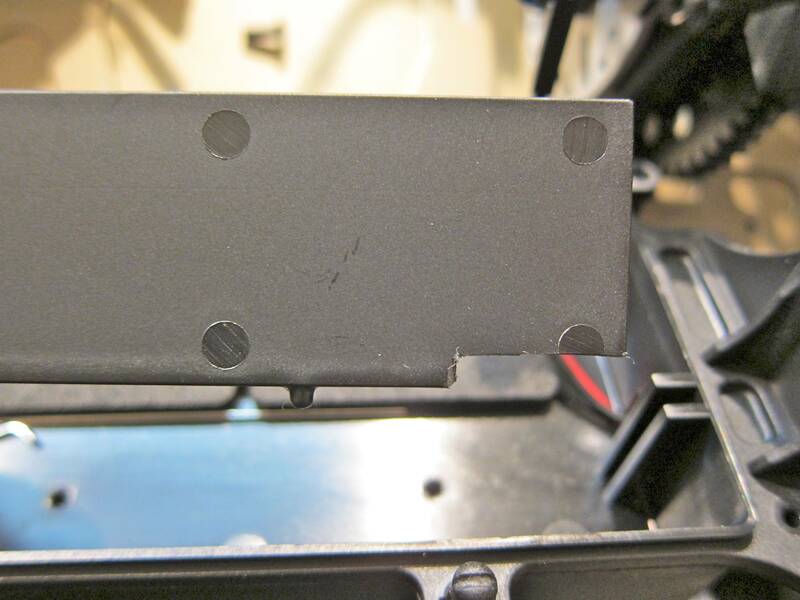 Use Dremmel cutting disc to cut off stock plastic mount. No drilling is required. The 4 stock bolt holes will be used to mount servo. Put servo wires through hole in servo mount. Loosely bolt the mounts to the servo. Place servo and mounts on chassis. Run wires toward battery box area. Reuse 4 stock bolts to fasten the servo mounts from under the chassis. Tighten the top 4 servo mount bolts. Cut notch in battery box divider for wires to run under. Run the volt regulator's long pigtail up to Ch1 (steering) channel on the receiver. 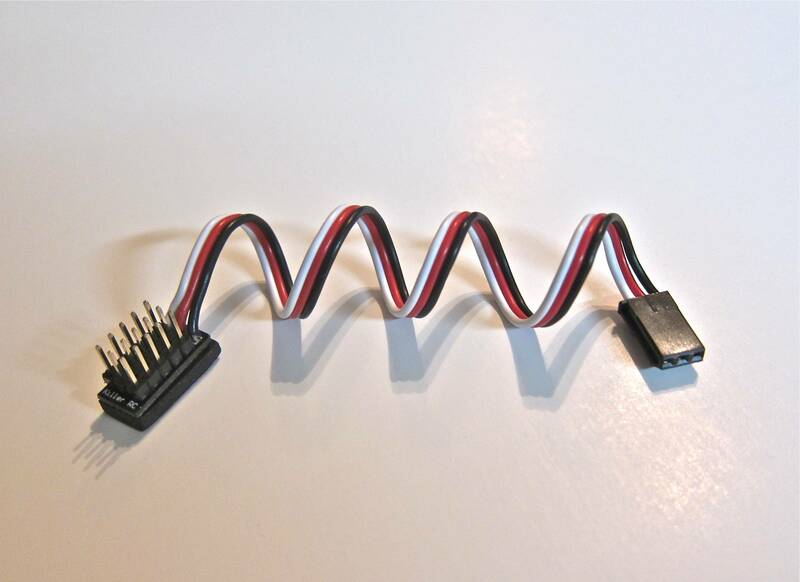 This pigtail carries the 6v/8v power that powers the receiver and throttle servo. Plug in the power from the on/off switch, and the two plugs from the Hitec servo. The Servo-Max voltage regulator includes more detailed instructions on how to use and install it. Turn on transmitter and receiver power. Center the steering trim. Bolt the DDM servo arm to the stock linkage. You may need to spin the ball end to shorten the length of the steering linkage turnbuckle. 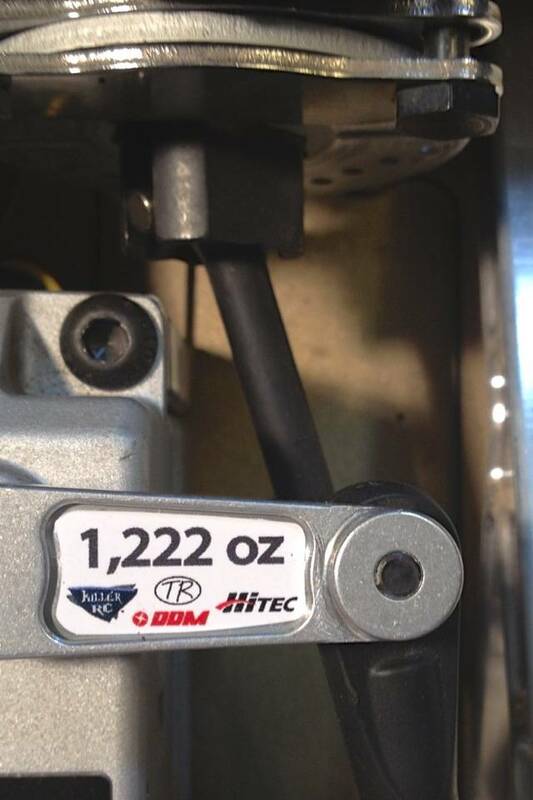 Install sticker that comes with the Servo-Max voltage regulator. Put some foam under and beside the battery to keep it from vibrating and moving around. This is real important, if you want the battery to last a long time. Now use Sub-trim to get your tires straight. 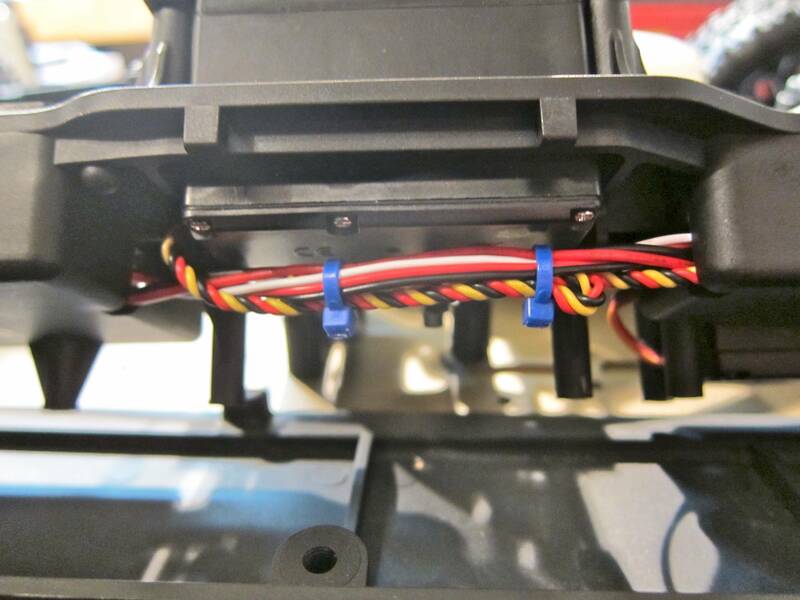 Adjust EPA (end point adjustment) to keep the servo from traveling too far and stressing the Losi 5IVE's servo saver. That's it. 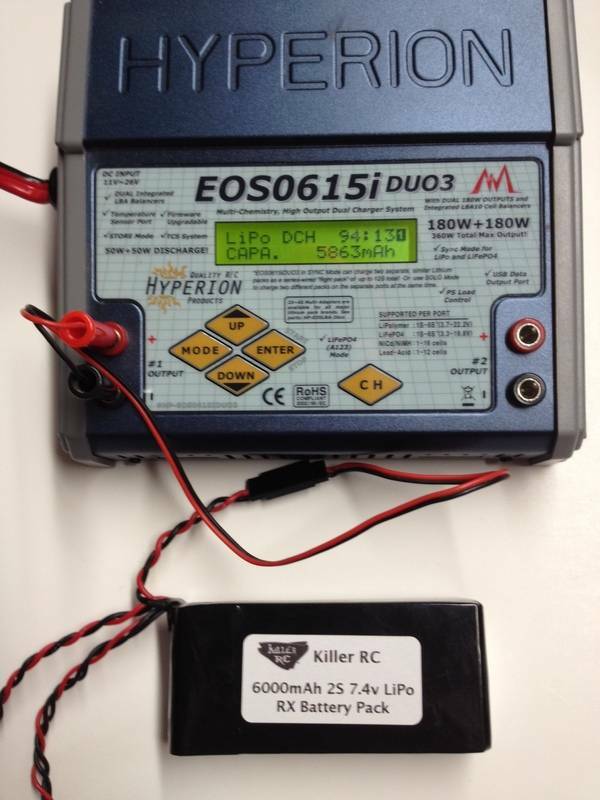 Charge the Killer RC 4S LiPo on 14.8v 4S mode, at around 2 amps. If you are in a rush you can charge it at a max of 3.6 amps. New LiPo battery packs come half charged, so it should only take about 30 minutes to fill up the battery to full capacity. If you do not plan on running the vehicle right away then just leave the battery half charged until you are ready to run. LiPos do not like to be stored fully charged for a long period of time. 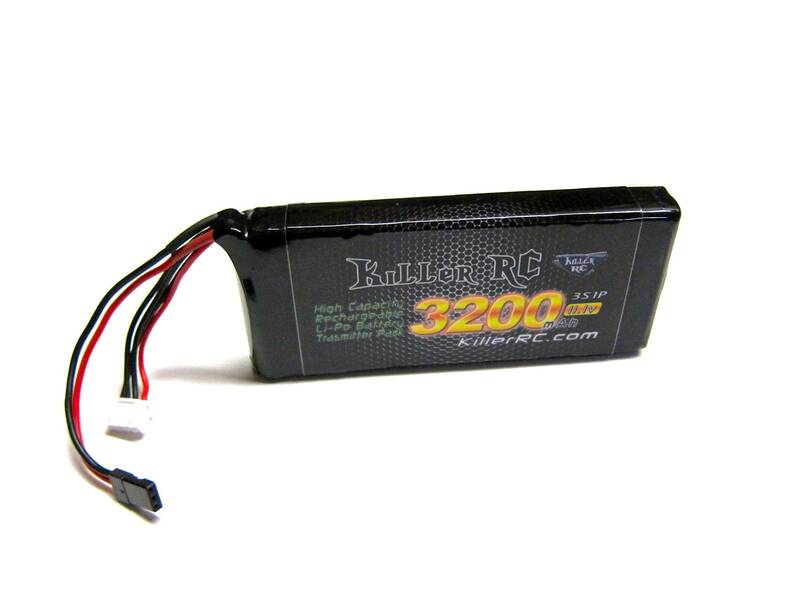 You should get at least 4 tanks of gas from your Killer RC 3600mAh LiPo before you need to recharge it. 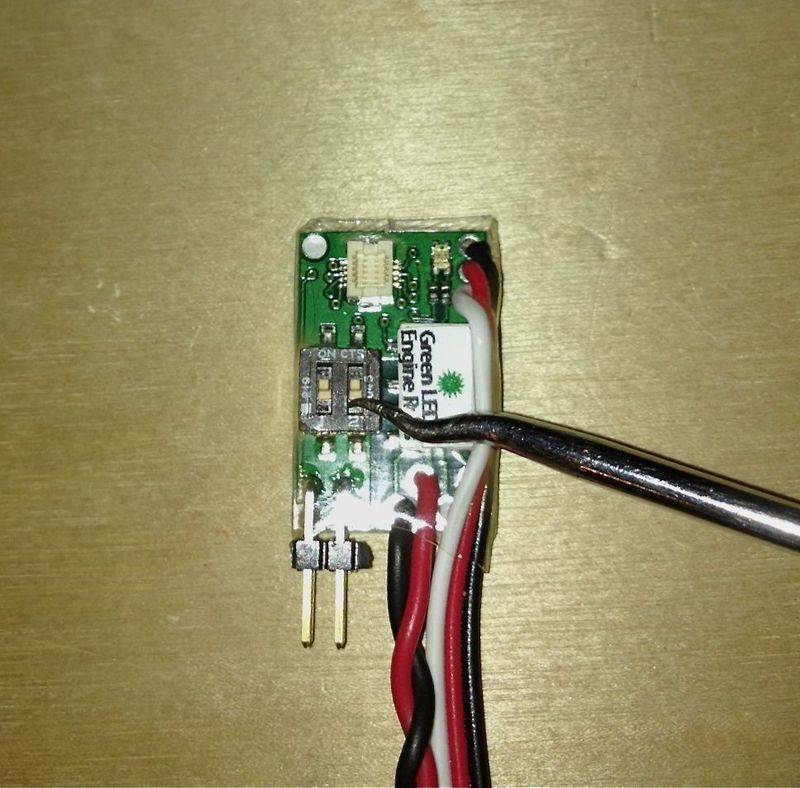 Once your Killer RC 14.8v LiPo gets down to 12.0 volts the Servo-Max voltage regulator will automatically drop the 6v/8v output to the receiver down to 4.5 volts. This sudden drop in voltage will make your Super Bee kill switch activate and kill the engine. You will then know that it's time to stop and charge the battery. Running a 4S LiPo below 12.0 volts will void the warranty. Once you have this servo kit all installed, you can then install your Super Bee kit, if you haven't installed it already. It installs just the same as it usually would. The Super Bee plugs into the Aux spot on your receiver. If you have the Servo-Max set at 8v (for high voltage 7.4v compatible throttle servo and receiver) you will need to set the Super Bee kill switch at 6v cutoff (The Super Bee LED should do 6 amber LED flashes, one green flash, when you turn on the power). If you have the Servo-Max set at 6v output then you will need to set the Super Bee kill switch at 5v cutoff (5 amber LED flashes, one green flash). It simply gets plugged in between the 14.8v battery and the Servo-Max voltage regulator. I recommend mounting the Super Switch in the battery box lid, back by where the battery and regulator will be. And not use the stock switch location up by the receiver. Just a few more notes about this servo. Once you get it installed and working you need to check your radio settings before you run the truck. The Hitec 900SGS is a digital servo, so if you also have a digital throttle/brake servo then you can set your radio for High resolution. If you have an analog throttle servo then you need to stay in Normal resolution (11ms on Spektrums). If you have a Losi with stock servos you can move the old stock steering servo (Losi S900S (digital)) to be the new throttle servo, and get rid of the old analog throttle servo. Center the steering trim. Then adjust the Sub-trim to get the tires aiming straight forward (just eyeball it). Some cheaper radios might not have a Sub-trim menu option. Then set the EPA (end point adjustment). This servo has crazy power. 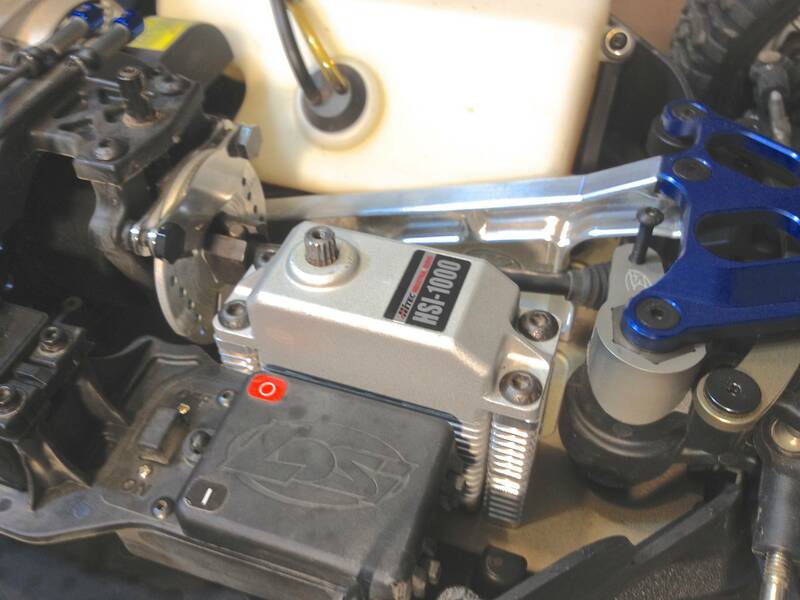 You don't want it pushing too far and stressing your steering linkage, plus it wastes battery power when your servo moves farther than it needs to. Make the EPA stop increasing once the wheels stop turning, then back it off a few more clicks. If you hear the servo saver "creaking" or you see the servo saver cam start to open up then you need to adjust the EPA so that the servo isn't traveling so far. The EPA will probably not be the same on both Left and Right. Set it appropriately for each direction. Go run the car and see how it coasts. It might need a few clicks of trim to get it driving straight. This servo is digital, so it might make some buzzing sound. Nothing to worry about. If it really bugs you then you can sometimes lessen the buzzing by adjusting the Sub-trim a couple clicks. If you have a ServoMax and also a Killer Kontroller light controller this is how it works. The Killer Kontroller just goes between the ServoMax and the radio receiver. There ServoMax plugs in to the steering pins on the Killer Kontroller. The Batt spot will be unused, since the ServoMax will be powering the light controller through the long steering pigtail coming from the ServoMax. The Hitec 1000 is the big gray servo in this picture. 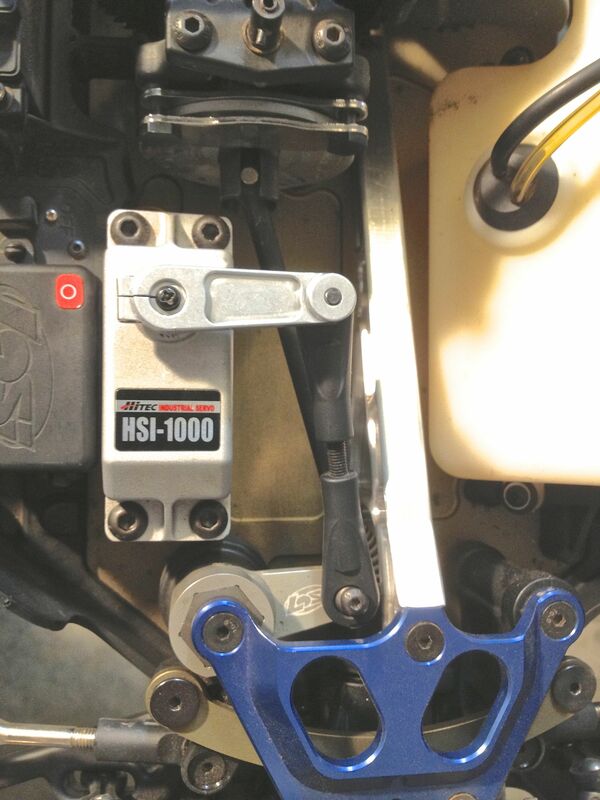 The throttle servo in this picture is the one with the blue arms. 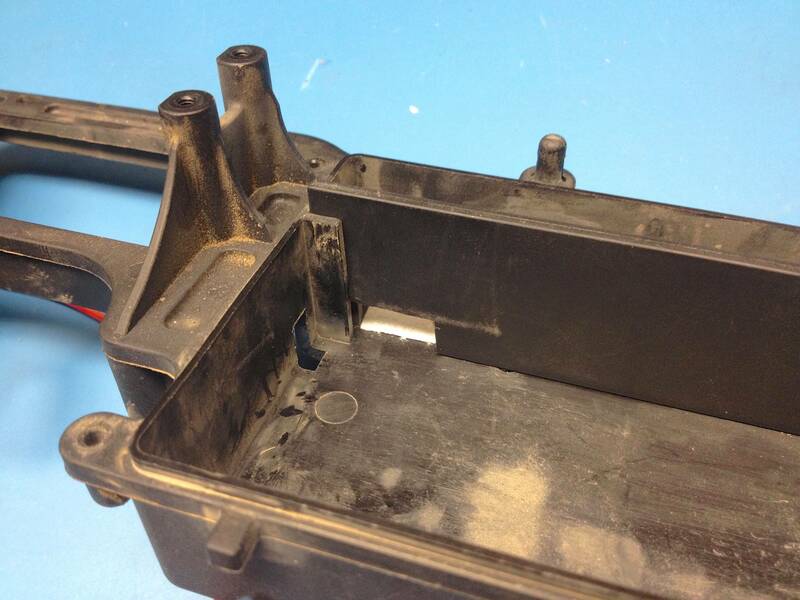 Be aware that you will have to move the receiver down into the bottom of the battery box. You can drill a new hole for your antenna, or if you have a good radio like a Futaba you can usually just leave the antenna inside the battery box and still get good range. I'm very happy with the results of the first full discharge. The charger stopped discharging with about 6% capacity left. After a few cycles this pack should hit 6000 pretty easy. The cells are staying perfectly balanced. Fits nicely in the Losi 5IVE battery box. It's lighter, stronger, smaller, and has twice the capacity of the stock battery. This is the ultimate radio receiver battery pack. 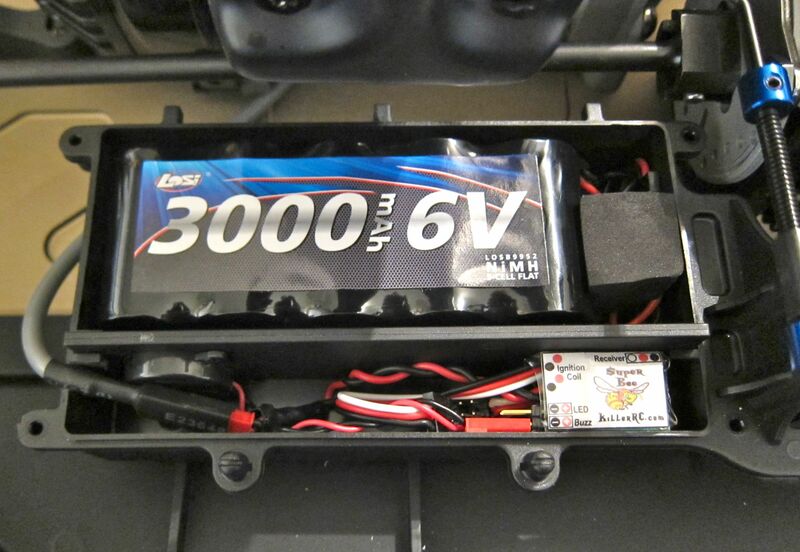 In a Losi 5IVE, this battery pack is short enough that you can even fit the radio receiver right next to it, if you want to move all your electronics to the battery box, and stop using the small Losi radio box. 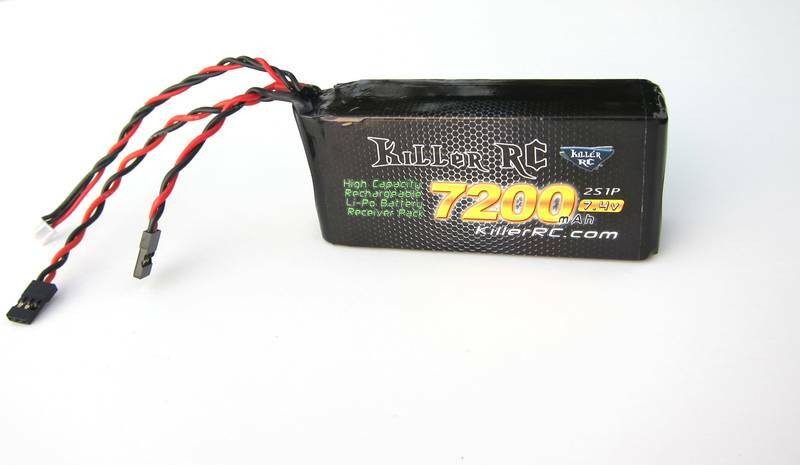 The Killer RC 7200mAh LiPo fits easily in the Losi 5IVE battery box. There is some foam inside the cardboard box that the LiPo battery comes in. 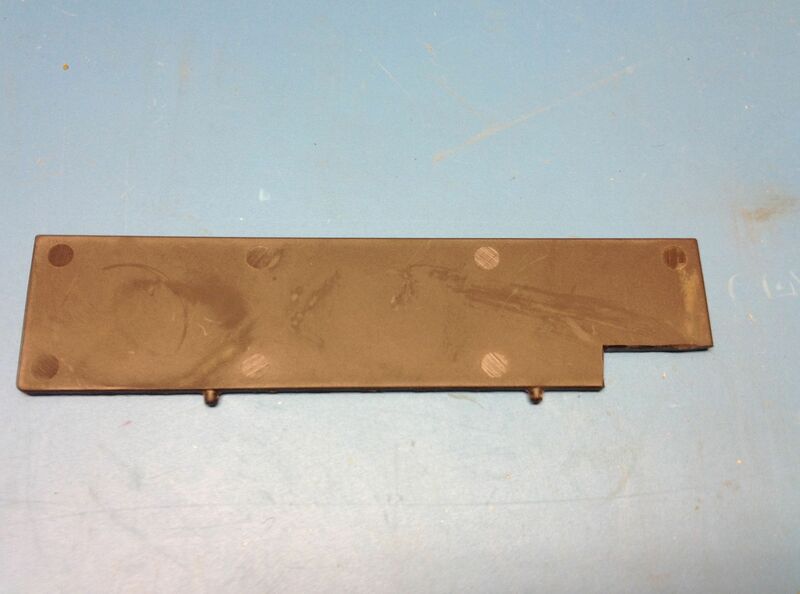 Use this foam, along with the stock Losi foam pieces, to cushion the battery on the bottom and sides, to reduce vibration and movement. Futaba 3PK, 3PM, 3PMX owners can soon pack a whopping 3200mAh of lightweight and long lasting 3S 11.1v LiPo power into their radios. This is a pic of one of our new prototype packs. It just plugs right in and fits perfectly in most radios that have 8 "AA" batteries. This high quality pack will last 2 to 3 times longer than AA Alkaline batts. Futaba 3PK, 3PM, 3PMX owners can soon pack a whopping 3200mAh of lightweight and long lasting 3S 11.1v LiPo power into their radios. . It just plugs right in and fits perfectly in most radios that have 8 "AA" batteries side by side. This high quality pack will last 2 to 3 times longer than AA Alkaline batts. 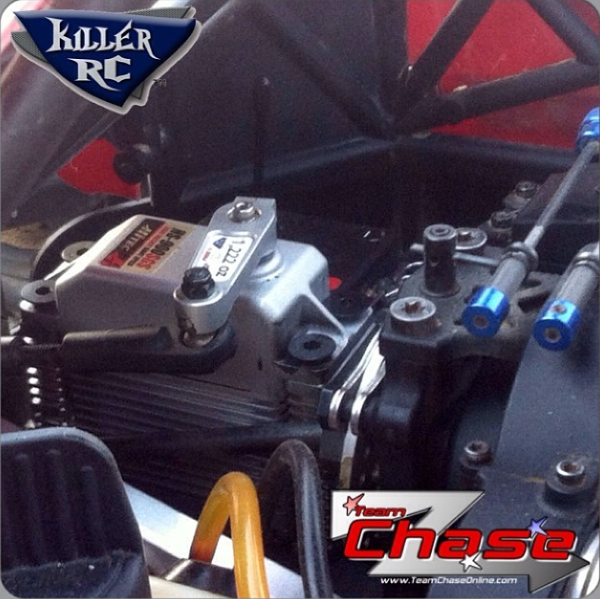 Killer RC has safe, secure on-line ordering available 24 hours a day, 7 days a week. We accept VISA, MASTERCARD, DISCOVER, AMERICAN EXPRESS, APPLEPAY and PAYPAL. Money orders, cashiers checks are also accepted. Personal checks are not accepted. Sorry, we do not match prices from other retailers. We simply offer low prices throughout the entire year. Check the Killer RC forum and Facebook page for coupon codes and special deals. If you’ve done all of this and you still have not received your refund yet, please contact us at info@killerrc.com. My product arrived in the mail damaged. What do I do now? Take a photo of the damage and email it to us so we can handle the issue appropriately. You can use our support page to contact us and send us details and the photo. We’ll try to get back to you with an answer within a few hours. Most Killer RC products are warranted for 1 year. Warranty only applies to the original purchaser. Warranty is void if the Super Bee, Killer Bee, Servo-Max, Light Controller, Volt Meter, or Buzzer is mounted anywhere outside of the battery box, exposed to liquids, or high voltage, or if the shrink wrap has been removed. The red CY push button kill switch is not covered under the warranty. 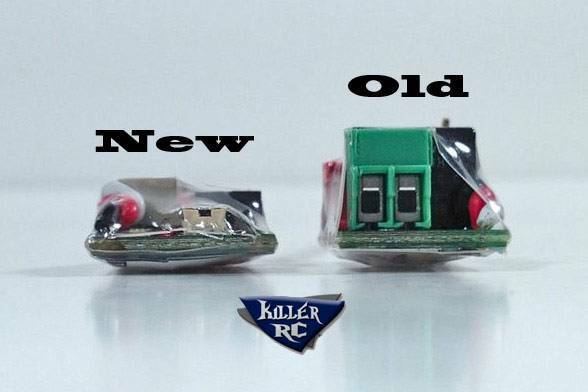 Only Killer RC brand LEDs and Buzzers may be used with the Super Bee or Killer Bee kill switch. The Servo-Max voltage regulator has a 1 year warranty when used with a Killer RC 4S LiPo; warranty is void if used with a non-Killer RC battery. 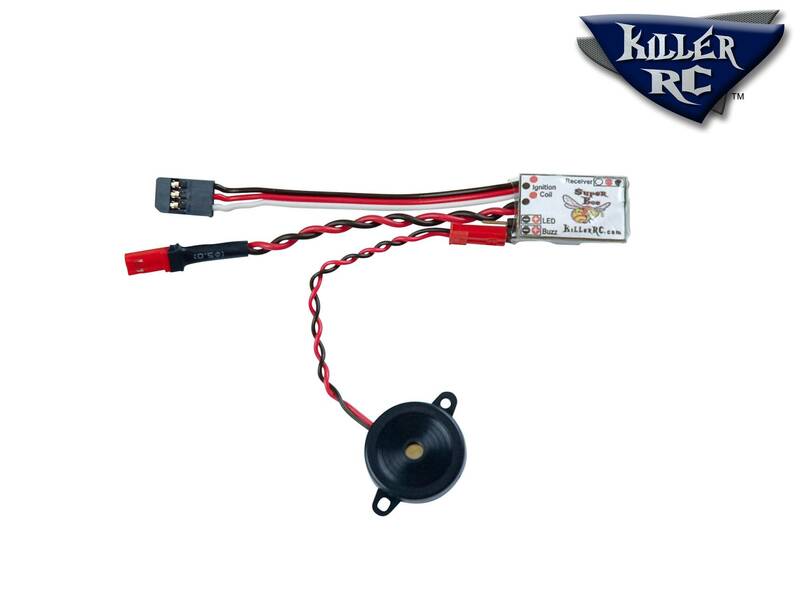 Killer RC gas receiver LiFe and LiPo battery packs have a 1 year warranty when used with a Super Bee Kill switch, which protects from over discharge. 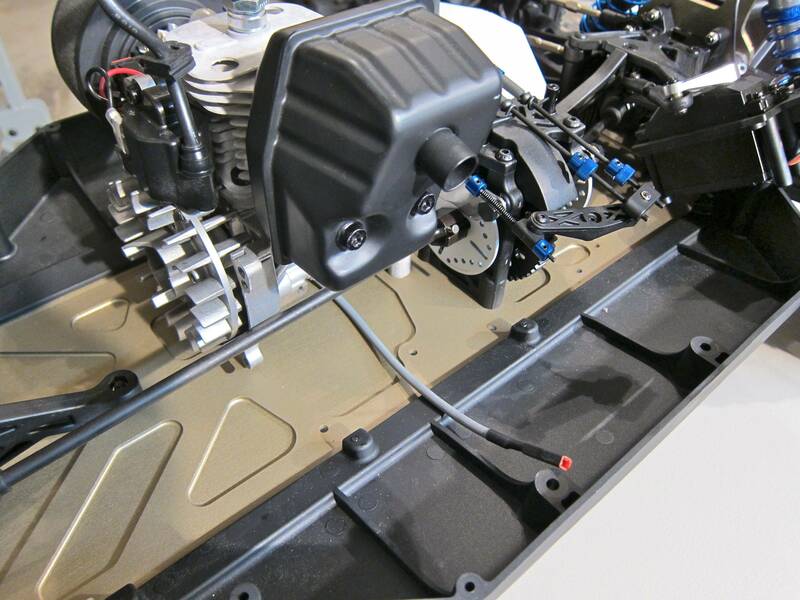 Battery warranty is void if the pack is punctured, overcharged, or over-discharged. The Killer Kontroller light controller has a 1 year warranty when used with Killer RC brand LED lights. Using “homemade” or other brands of lights voids the Killer Kontroller’s warranty. Killer Kables and rear turnbuckles are warrantied for 6 months. 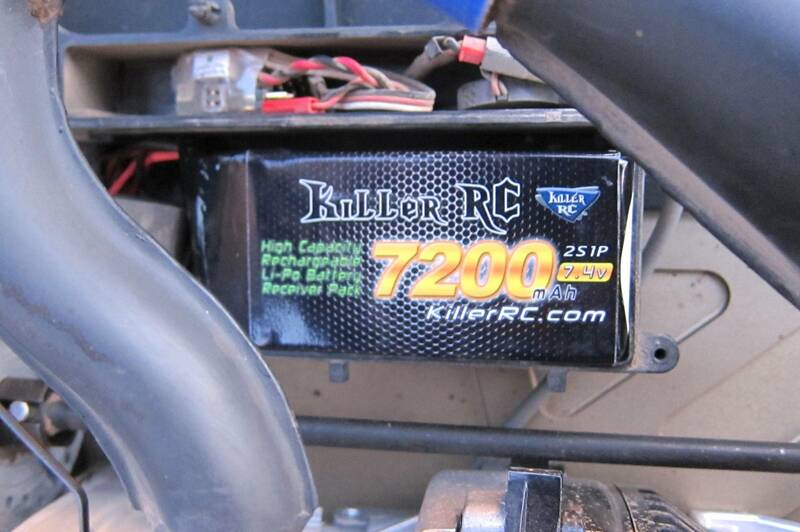 The Killer RC pull starters and Power Starter have a 30 day warranty. Warranties only apply to the original purchaser, and are not transferable. Visit the support page for submitting your issue and photos.